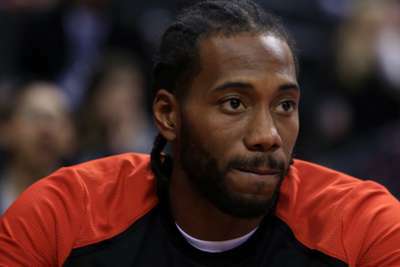 Toronto Raptors star Kawhi Leonard will continue to sit out one game of the team's back-to-back series to help manage his recovery from injury. Leonard played just nine games for the San Antonio Spurs last season due to a right quadriceps injury, but Toronto head coach Nick Nurse assured the two-time NBA All-Star is not dealing with any lingering issues. Instead, the Raptors are keeping the bigger picture in mind with so much of the regular season still to come. "The plan is for a little while here to not let him play [both games of] the back-to-backs," Nurse said of Leonard after the Raptors' 107-98 win over the Phoenix Suns on Friday. "I don't think we've decided how long that's gonna be yet. We're going game by game." Leonard, who scored 19 points to go with six rebounds and five assists to help Toronto to improve to 8-1 against the Suns, added: "I just wanted to get healthy. I feel healthy now, and they just don't want to rush into things. I don't either. It's a long season, so we're thinking about the long road." The Raptors have another back-to-back series coming up with a game at Los Angeles Lakers on Sunday followed by a meeting with the Utah Jazz on Monday, but Nurse is not sure which game Leonard will sit out. He did however provide an update on the issue that forced Leonard to leave the match against the Suns in the fourth quarter.